Kiosk 3 is our next-generation take on an old favorite. Kiosk 3 delivers the same functionality as our HD23 kiosk, but now features: multiple folder searching, Photogize CloudCover™ compatibility, Facebook Connectivity, and a new business model with a low annual software license. Kiosk 3HD is our next generation hardware photo kiosk featuring class-leading specs in a stunning, all-in-one design. 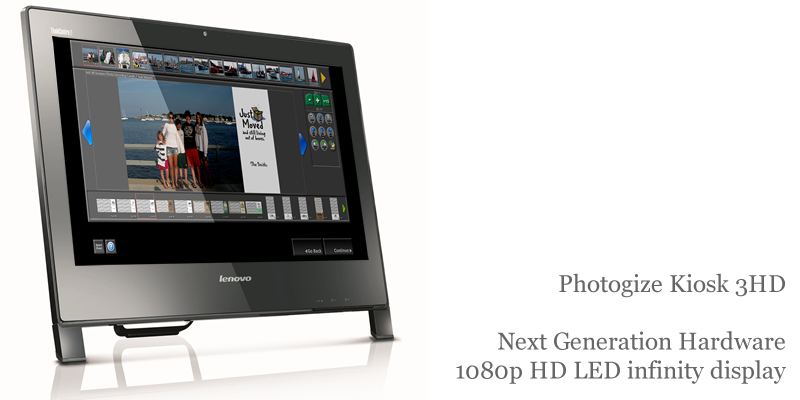 The new 1080p infinity display will present your products (and your customer’s photos) in a whole new light. Kiosk 3 can be delivered as software – you provide the hardware. And you pay for Kiosk 3 with an annual license fee. It’s never been easier to kit out your store with the RIGHT number of kiosks to move your customers OUT of line and INTO a transaction – no waiting! Kiosk 3 is compatible with three screen resolutions: 1920×1080, 1680×1050, and 1024×768. Pick the one that matches your available hardware. Need some advice on new hardware? We’d love to help – we’ll give you real-time recommendation for new Lenovo or Dell hardware. 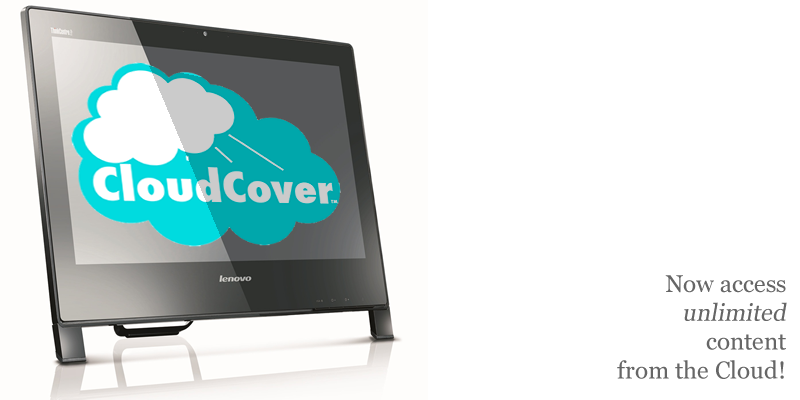 Best of all, CloudCover presents a unified product platform for online and in-store: your PhotoCentral and Kiosk products will match perfectly. What makes Kiosk 3 a Smarter Cloud photo kiosk? Simply this: Photogize Kiosk is a high performance software application. And it can work with or without an internet connection. The internet is only used to download content from the cloud. And once the content is downloaded, it is cached locally. So if your connection goes down, you’re still in business. Today’s consumers want a wide selection of high quality photo prints and creative products. But they don’t want the confusion caused by finding one set of photo products on your website and a different selection of products on your kiosks. When you upgrade to Photogize Kiosk 3, you can be certain you’ll avoid this customer confusion. Your kiosk product selection will be EXACTLY the same as your online PhotoCentral service. Your new kiosks will include an extensive set of professionally designed templates – the same set found in PhotoCentral. And adding new specialty products to Kiosk 3 is easy. Simply activate new specialty photo products we preload or CloudCover products you select… all done centrally in Photogize Lab. ALL your new specialty products are immediately available– in-store at your Kiosk 3, and online at PhotoCentral. We’ve developed an all new way to look at your photos: ALL populated folders from ALL inserted media are presented on our simple touch screen. 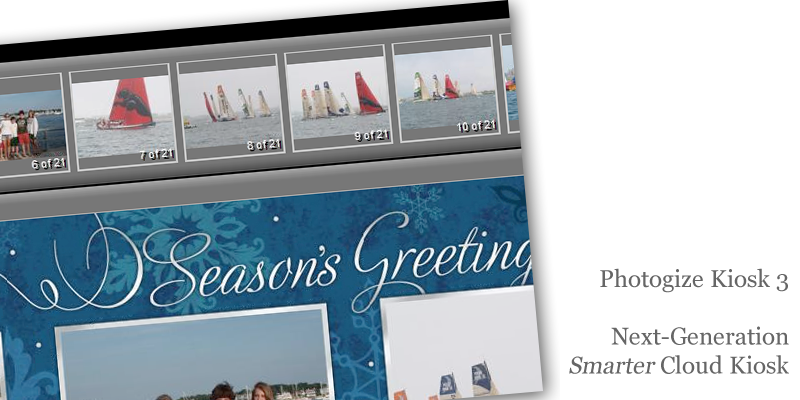 Just touch to select or deselect the photo groups you want to use in your print or creative project. You can select one, a few, or all folders on all your media. It’s dead easy to use and requires only a fingertip! Our new model is simple. You pay an annual license to use the kiosk software. Importantly, you no longer pay a kiosk revenue share on print jobs that use the CloudCover products you create or license. So 100% of the revenue you generate is yours to keep. Simple, isn’t it? Just make sure your hardware meets our minimum requirements, download the software, and install. And anytime you want to move the software to another PC, just post the remove code to our HelpDesk and we’ll give you another license code for the new hardware. Better yet, add LabCare to each installation and we’ll do it for you. With our new Facebook Connect option, your customers can now print their Facebook photos and friends’ photos at your kiosk. No media card needed! Just log in at the kiosk, pick your photos, and print. Our optional iPhone Connection Kit will treat your customer’s iPhone or iPod Touch like it’s an external drive, and make photos automatically available for viewing, printing and creating on your Photogize Kiosk 3! The Connection Kit will display all the still photos stored in the iPhone’s Camera Roll on your kiosk. (and not read or display any videos stored.) The Camera Roll is found within the Apple Photo app pre-installed on every iPhone. Apple’s Camera app and many leading 3rd Party companies, as Instagram, Pic Collage and Camera+ by default will store the photos in the Camera Roll. The iPhone Connection Kit is compatible with ALL Photogize Kiosks: Kiosk 3, Standard, Creative, HD and HD23; and is compatible with ALL iPhones and iPod touch models. The kit includes a dock, USB cable, dock adapters for older iPhone models, and utility software that is installed and runs in the background on your Photogize Kiosk. The iPhone is the most popular digital camera in the US! It’s critical that you support this creative and explosive market. Order your iPhone Connection Kit TODAY! Price includes remote configuration by a Photogize Technician. Our Scanner Kit gives your customers a fast and easy way to scan photos and flat artwork for print and specialty production on the Photogize Kiosk. The kit includes an Epson Perfection V370 scanner and is super easy to install. To use, just lay one or more photos or pieces of flat artwork on the scanner glass. Then touch ONE button on the kiosk to individually scan, de-skew, de-dust, and color-optimize each photo. It couldn’t be easier! Order your Scanner Kit here.